However, there’s one deep-fried treat I love even more: churros. For those who know me well, it’s pretty obvious why I can’t get my hands off these: they’re covered in cinnamon sugar! As a cinnamon addict, that’s pretty much as good as it gets. 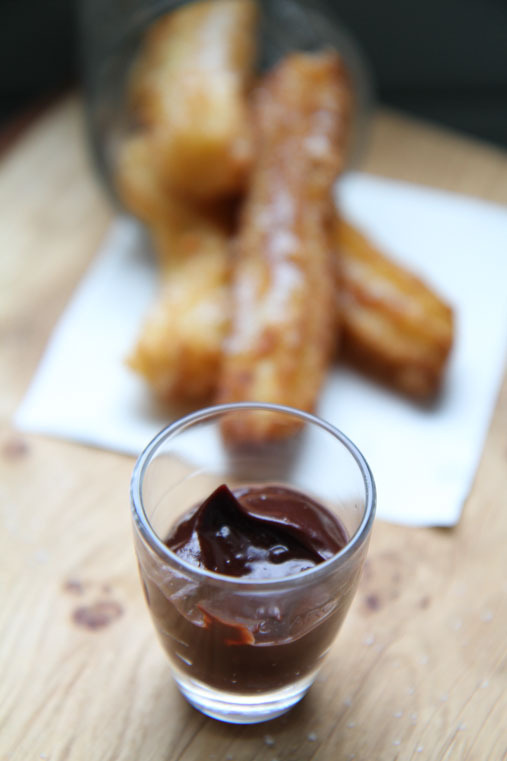 Traditionally churros are eaten for breakfast in Spain and Latin America. I first ate churros on one of our many holidays to Mallorca. They weren’t that good to be honest, just deep-fried rings tasting of nothing but grease. Little did I know that these finger-shaped doughnuts can in fact be absolutely amazing. I only rediscovered churros in Luxembourg – of all places – at the annual Schueberfouer, a huge fun fair which takes place every year in September in the heart of Luxembourg city. It’s pretty much a coglomeration of fun rides (think rollercoasters, ghost rides and a massive ferris wheel) and food stalls. One of the many food huts is the – in Luxembourg infamous – “Jean la Gaufre“. This Belgian waffle stall started selling churros about a decade ago. And that was the beginning of my love affair with churros: crunchy deep-fried dough, covered in a generous dusting of cinnamon sugar, and served with a Nutella-style chocolate dip. Every year I return to my hometown for the Schueberfouer, and every year I can’t wait to get my hands on a portion of sweet, crispy churros. 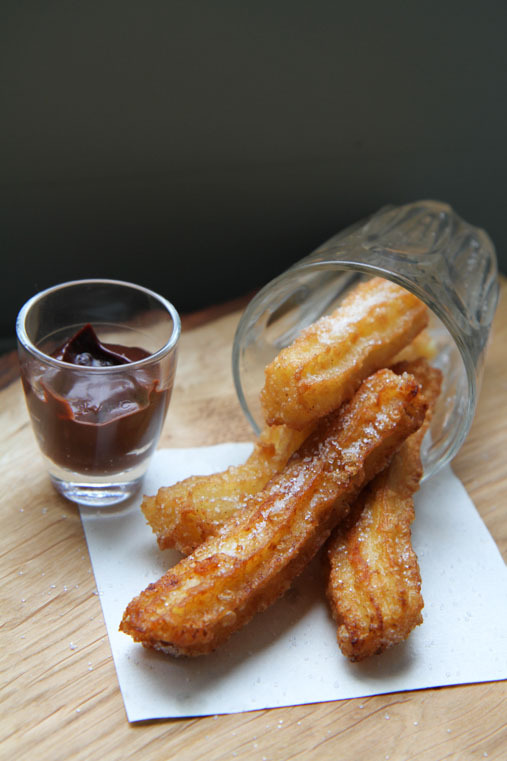 So, for this post I decided to give it a go, and make my own churros. After all, what can be so hard about deep-frying some batter? Well, nothing really (apart from making the whole flat smell of frying batter, but that’s well worth it). It’s as easy as pie! 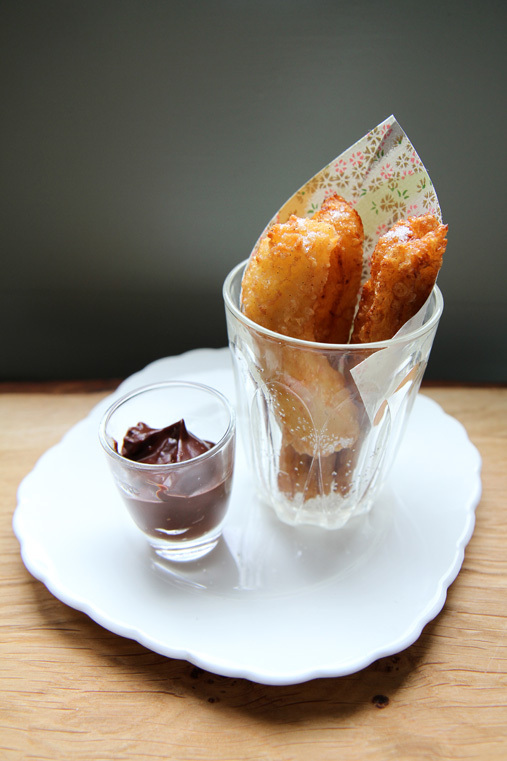 So, give it a go and see for yourself why churros are the best treat in the world! Start by making the dough: put the butter and a pinch of salt into a saucepan, add 330ml of boiling water and bring to a rolling boil until all the butter has melted away. Lower the heat and beat in the vanilla bean paste, flour and baking powder. Stir vigorously for about a minute until the batter pulls away from the sides of the pan and forms a ball. Remove the batter from heat, beat in the eggs until smooth, then leave the dough to rest for 10 minutes. Meanwhile, make the cinnamon sugar by mixing the cinnamon and the sugar. Heat the oil in a wok or big, deep saucepan. Put one small piece of batter in. Once it starts bubbling, the oil is hot enough and you can start frying the churros. Pipe 8-10cm long pieces of dough into the oil, cutting them off with a pair of scissors. Don’t put in more than 6 churros at a time, otherwise the wok becomes too crowded and the churros will stick together. Fry the churros until they’re golden brown, for about 3 minutes. Meanwhile, start melting the chocolate. Put all the chocolate with the chili and about 30ml cream into a saucepan. Melt over a low heat or a bain marie. Gradually add more heat if you want it creamier. Don’t forget to keep an eye on the churros, and take them out of the oil once they’re nicely golden. Drain them on kitchen paper, and pipe in the next batch until there’s no batter left. 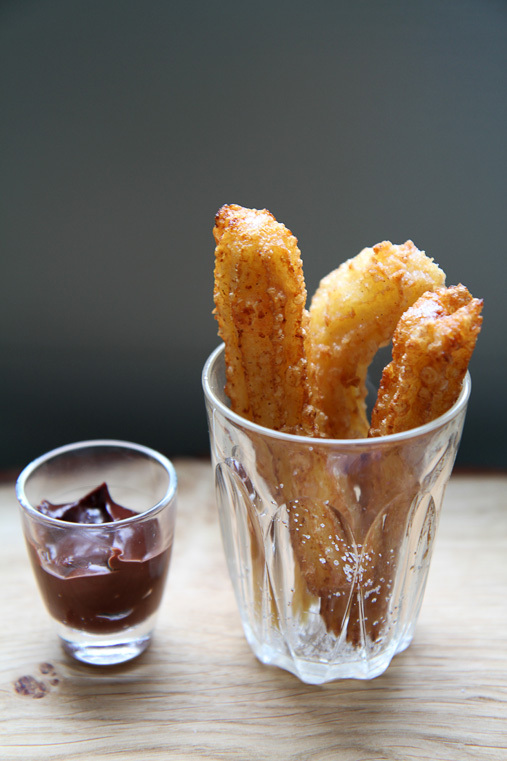 Once all the churros are done, cover them in cinnamon sugar and serve with the melted chocolate as dip. Wow, these look soooo yummy! I absolutely love churros and it’s about the only thing I eat at the Schueberfouer every year (and at the “Mäertchen” as well :-)). I’ve never thought about making them myself so far but I’ll definitely give it a try now thanks to your recipe! Great blog, by the way! I’ve been reading it for a while and really like the layout, your writing and, of course, your recipes! Ah yes, how could I forget the Märtchen! Yum yum!! These looks amazing! I am def going to have to try these soon. And I love the chili chocolate sauce mmmmmmmm making me hungry…. Oh my this looks so delious – Actually here in Copenhagen you can buy them freshly made and still warm at Tivoli – I usually have mine with strawberry jam – fab winter food. Ah yes, I was in Copenhagen a few years ago but unfortunately didn’t make it to the Tivoli! Looking forward to meeting you in Berlin at The Hive, yay! Oh how i love churros, and since living in spain i can have them every da! We even have a churro place that is open 24/7 !! Argh, now you’re making me SUPER jealous!!! Where is that place! I need to go!!! This reminds me of afternoons with my grandpa. He had a churro machine and we used to have them all the time filled with “dulce de leche” (a heavy caramel). Oh, I miss him and I miss eating home made churros. Hi Anne, Love your recipes, however, here in America we don’t measure by grams (g,) so I’m have to guess what some of your ingredient measurements are… Any chance you can include (via ” / “) cups and ounces ( / c. , / oz.) for we Americans ? I / we don’t have a conversion chart handy when cooking, baking… thx, Char D.
PS, Love churros, too ! Look forward to trying these soon, Char D.
Hi, Neat post. There’s an issue along with your site in web explorer, would check this? IE still is the market leader and a huge component of people will pass over your excellent writing due to this problem.